Keep your special princess safe in sparkly style with our Princess Violet Medical ID Necklace! A Lauren’s Hope original, this adorable medical ID necklace features a smiling princess in a yellow gown set against a glittery purple background. The princess’s scepter is topped off with a medical caduceus symbol to alert first responders to your child’s information, engraved on the back. As with all stainless steel Lauren’s Hope medical IDs, both the pendant and necklace chain are nickel-free stainless steel for comfortable, safe, water-resistant wear. 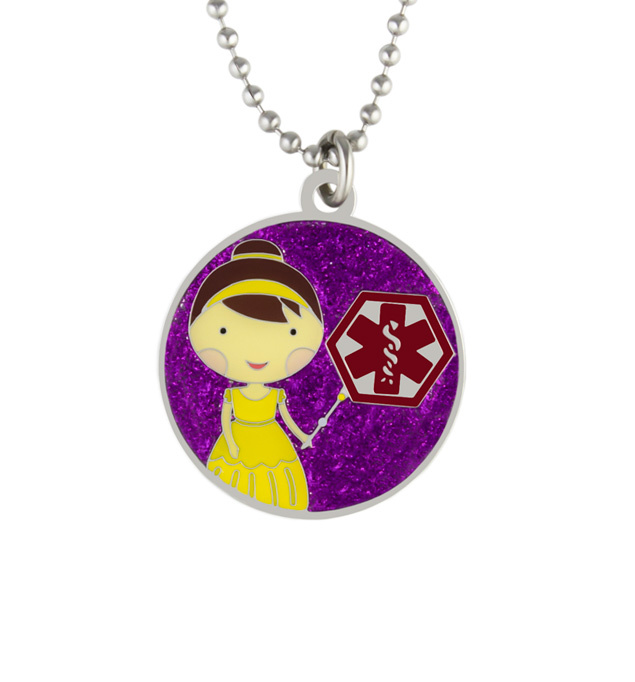 The Princess Violet Medical Alert is a durable kids’ medical alert necklace you’ll only find at Lauren’s Hope.